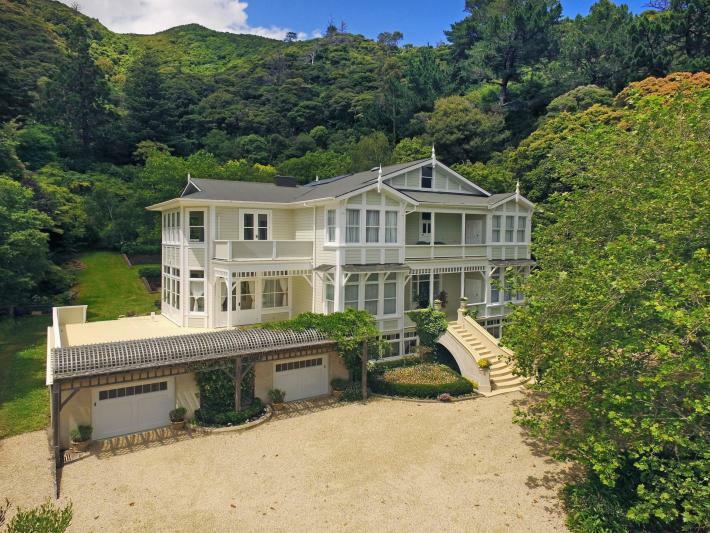 Located on the boundary of the Eastern foothills reserve in the Hutt Valley, 20 minutes approximately from Wellington City, this large character residence presides over 7,023 sq m of lush park like grounds and mature plantings. Built in the early 1900s, this 650 sq m home offers spacious living options, very large bedrooms, a sun-drenched conservatory, huge basement, garaging, storage and attic space. The home has many features including a large open entrance foyer with an impressive timber staircase and flooring throughout. There are also five ornate fire places, an impressive 12-foot stud ceiling height and sash windows - all lovingly restored to 'as new' condition. The formal lounge and dining rooms can accommodate a very large family for all those Christmas functions and memorable family occasions. Additionally, there is a spacious family/media room for the more casual living. The kitchen features a large central granite island with multiple cooking amenities and stunning lighting detail. A separate laundry room adjacent, offers storage and access to the outdoors. The four large double bedrooms are all located on the upper level - the generous master bedroom enjoys walk-in dressing room facilities and semi en-suite. The additional three spacious double bedrooms all offer built-in wardrobes, an additional en-suite and balconies to enjoy the magnificent garden vistas. Sited on a manageable 7,023 sq m, with great sun, it has ample off-street parking for multiple vehicles. There is double internal access garaging and additional storage room, a workshop and rooms for future development - hobbies, nanny accommodation, additional living for extended family etc. Seldom available, these sought-after grand properties enjoy the benefits of a bygone era lifestyle on the fringe of the city. This delightful family property won't last long. Be quick for this one! Call Vanessa or Paul now to view.